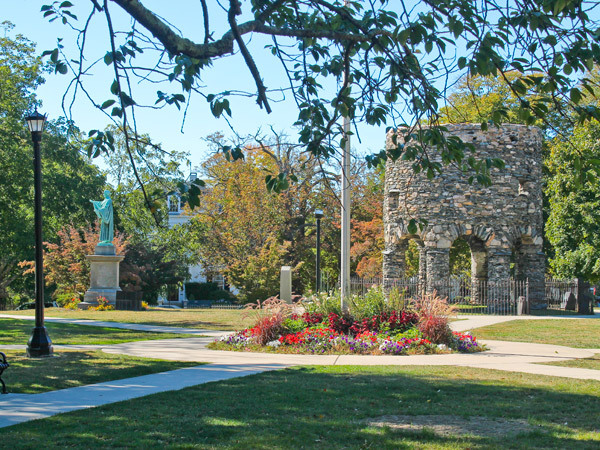 Named for Judah Touro, the Newport-born benefactor who funded its purchase by the City in 1854, this 2.25-acre park is home to the Old Stone Mill. 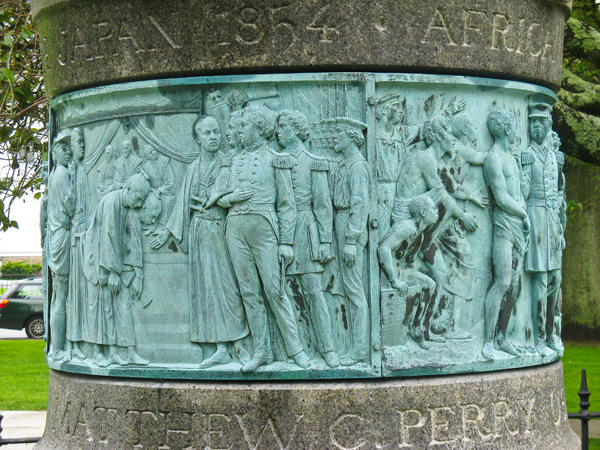 The Newport Mercury reported in 1855 that “a Mr. Bourmann of New York” was responsible for the park’s layout; but this was likely a reference to landscape gardener Eugene Baumann, who also landscaped the five-acre grounds of the nearby Beaulieu House, designed by Calvert Vaux. 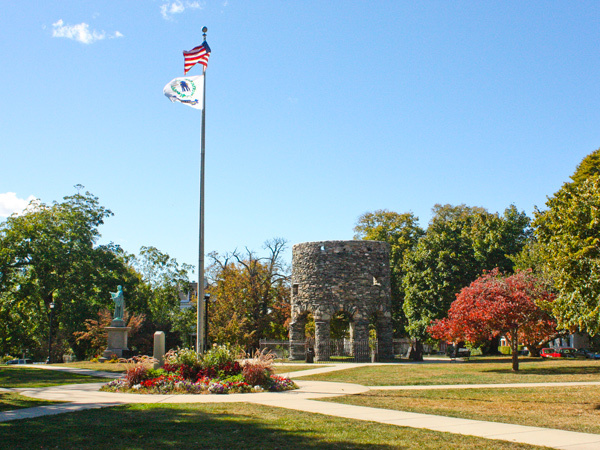 One theory credits Vaux with the design of Touro Park, as well as the music stand installed there in 1871 (but absent by the 1930s). By 1900 a large volume of fill was added to the park, covering serpentine pathways that have since been detected below the current surface. Comprising a relatively flat city block, the rectangular park is a grassy lawn bordered by four orthogonal streets and is buffered on three sides by sidewalks. 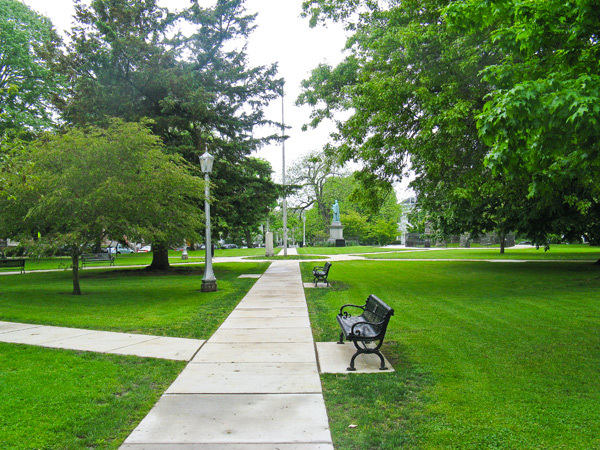 Cross-axial concrete paths provide access and converge at a central flagpole. 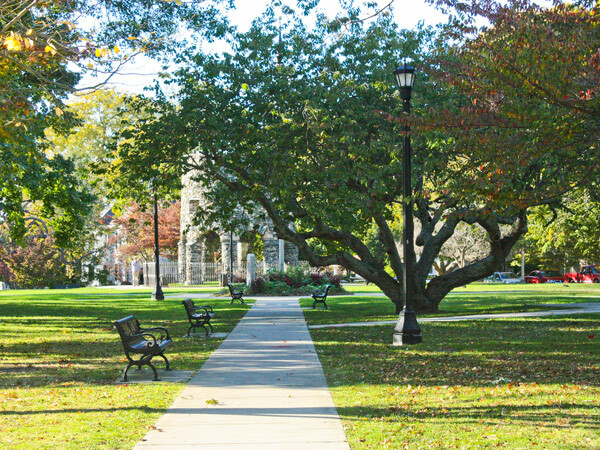 The park is planted with Norway maples, pin oaks, dogwoods, and black walnuts, while Victorian style benches and lampposts line the walks. 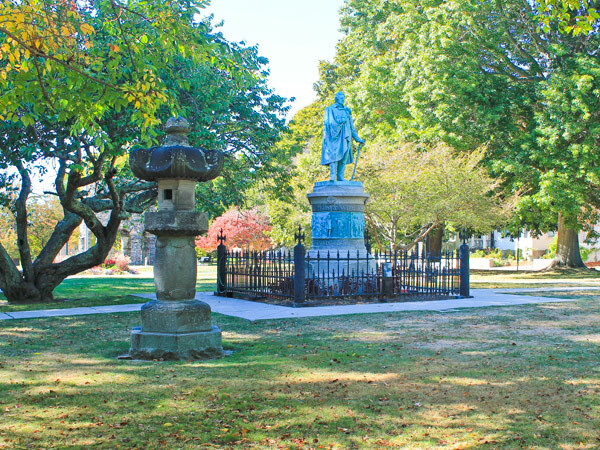 Prominently displayed is the bronze statue of native Newporter Commodore Matthew Perry, next to which stands the Temple Lantern, a gift of the Japanese Government in 1954 on the centennial of Perry’s opening of Japan to the West. 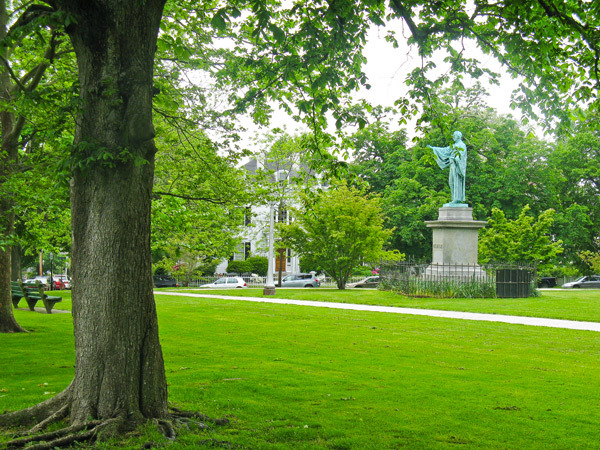 A bronze statue of the Unitarian theologian William Ellery Channing was erected in 1894, facing the church that commemorates his birth. 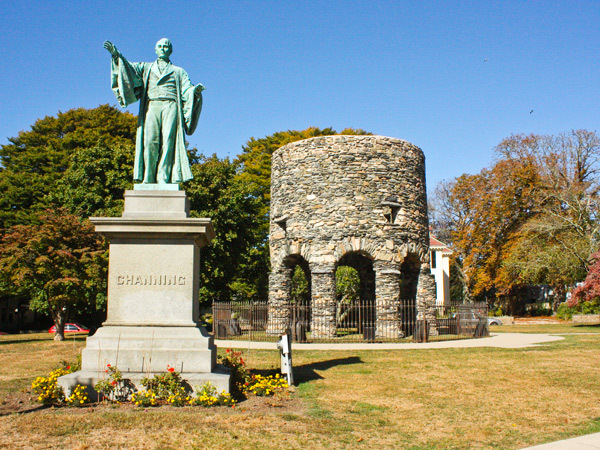 On the western side stands the enigmatic Old Stone Mill, a 28-foot-tall fieldstone-and-mortar structure supported on an annular arcade of eight pillars, whose original date and function are highly controversial: documentary evidence indicates a 17th-century windmill, but other theories include a church of the Knights Templar, a Norse baptistery, and, most recently, an Elizabethan horologium.